The world largest searchable home design website Houzz has been around for many years, becoming as common as the Yellow Pages of yore. Early adopting design and architecture firms found that creating a free company profile on Houzz became a great lead generator for new clients. This lead generation is still the case for many, but here I want to discuss other benefits a design firm can gain by using Houzz. First, let me address the best practices I feel a company can use on the web to build a relationship with prospective clients; I recommend for most firms that your “basecamp” on the web will be your firm’s website. Your website should show your best work, have a focused biography and a call to action. From this base camp you use social sites like a Facebook page, an Instagram feed, a Linkedin profile, a Twitter account. Next come shareable sites like Houzz, Pinterest & Youtube. Look at your main website like a highly produced brochure with great photos, directly messaging your firm’s capabilities. These other sites I am describing are forms of social and shareable online media that flesh out your firm’s online footprint. The social sites are for networking, for most companies I recommend one or more of the following social platforms: a Facebook page, an Instagram feed, a Linkedin profile, a Twitter account. Use these social sites as a marketing tool for more informal communication, posting timely entries, seeking to build a dialogue with clients and show your firm’s personality. Your social marketing on these sites should have a “voice” and point of view. Posts and content should not be too random, and social sites are about building affinity and dialogue, think like a good editor in deciding what to share & post. A note of caution, for any of the social and shareable sites, will work best for your firm when they are maintained with current updates and new content. Plan and forecast what sites you can keep on top of and select just those that you have time to keep current with quality content. The last group of sites I call shareable sites, and this is where I place Houzz. 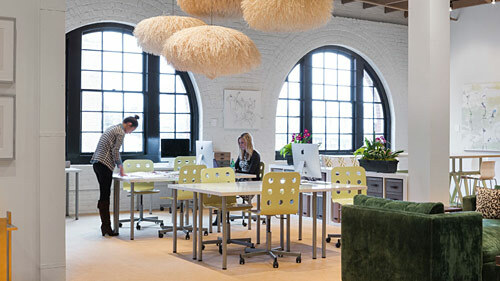 On Houzz, you are sharing your firm’s capabilities with photos. You can think about your profile on Houzz like back issues of magazine stories about your firm, only you are the editor of these. A Youtube channel and Pinterest boards could be used as shareable media too but here I want to concentrate on Houzz. I see Houzz providing your firm third party validation, reviews from past clients, a place for a second portfolio, a searchable database of your firms work, a publishing platform to share new ideas and a forum to interact with people interested in your work. Houzz has an air of third party validation, for the lay viewer coming to the Houzz site might see your firm’s profile of that of an online directory. The self-serving nature of your Houzz profile is subjugated in the overall user experience. But Houzz has very real life validation shown in your client’s review section. These consumer reviews allow you to let others sing the praises of your firm. Ask for and seek reviews from your best customers. Twice a year in my photography practice I take the time to build my review base. For me, I address each client when asking for review. I often give them some talking points to address in their review of my service; then after they review me I follow up humility and thankfulness. I reciprocate reviews. As I mentioned in the beginning, I suggest your main website be your basecamp and not a library of all the projects you have done. The best and most current projects should be live on your site, then consider using your Houzz profile as a place for a secondary portfolio. Your Houzz projects are in folders that can be grouped in many ways, by room type or case study. The flexibility and ease of uploading photos make your Houzz profile an easy and searchable library of your work. One caveat is you have to share these photos to the world. This second portfolio on Houzz can show all your projects, both completed and in the process. You can show a variety of photo qualities from the best professional photos to those from a phone. You can arrange the projects in the order you want. You can share folders with collaborators. 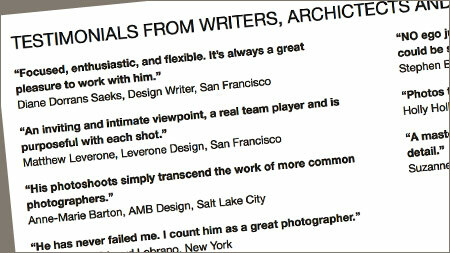 In my photography practice, I have scores of project folders on my Houzz profile. My core practice as an interior and architectural photographer is shown along with my expertise in little niche areas; I use my Houzz projects to address these niches. When discussing with potential clients, I direct them to these niche project folders. In this way, I have created an exhaustive body of work in my core and secondary practices. 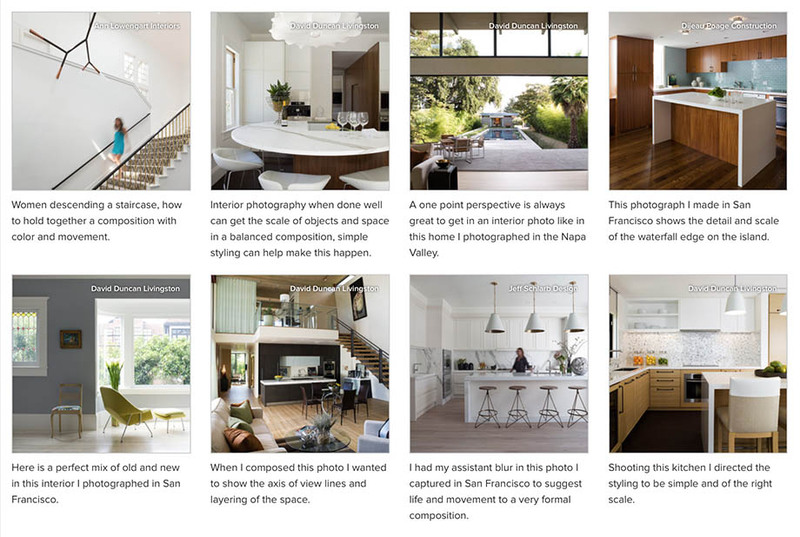 Your photos on Houzz have “keywords” attached to them that act as a gateway for those finding your work. On Houzz the more photos, the better, and the more keywords, the better. With Houzz, the volume of photos you have and the extensiveness of your keywords are part of the metrics that Houzz uses in returning each result. When key-wording for Houzz, I suggest you think in terms so simple as the house, home, room to more ethereal terms like light, romantic, modern, empty nester. Before uploading photos of a project take the time to list out your keywords, many will often be repeated don’t worry, only Houzz knows all your keywords, they are not shared to the viewer. Overall Houzz has more photos with better descriptors than any other site in the world.